The White Marlin (Kajikia albidus) was named “Osprey” (GFR10805), was caught by angler Junior Doerzbach while fishing the mid-Atlantic offshore waters of Maryland on, September 9th, 2016. Junior Doerzbach was fishing aboard the charter boat Rhonda’s Osprey with Captain Joe Drosey and mate Sasha Lickle, out of the Official Research Center, Sunset Marina & Atlantic Tackle (http://ocsunsetmarina.com/) located in Ocean City, Maryland, USA. 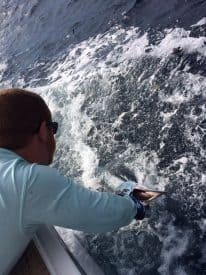 The White Marlin was estimated at 65 inches (165.1 cm) total length and released in excellent condition. 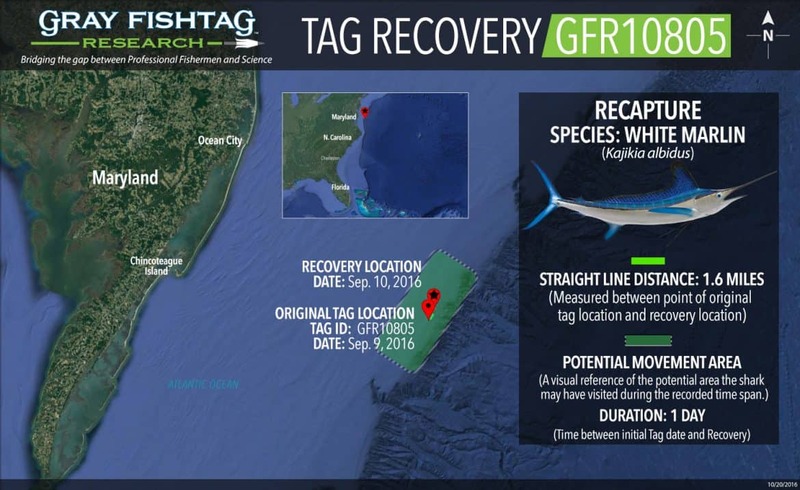 Incredibly, that White Marlin was recaptured the very next day on September 10th, 2016 by angler Ross Clubb while fishing with his dad and brother aboard their boat Chain Reaction out of the same facility, Sunset Marina in Ocean City, MD. The recapture was approximately 1.6 miles (2.57 km) away from the original tag location. During that 24-hour time period, the marlin stayed in the mid-Atlantic offshore waters of Maryland. Those offshore waters are home to numerous seafloor canyons which ideal habitat with an abundance of prey items, such as mullet, menhaden, jacks and common bait fish species. Fun Fact: While swimming, White Marlin commonly display a technique known at “tailing”, in which only the dorsal lobe of the caudal fin (tail fin) is visible above the surface of the water. The Rhonda’s Osprey charter boat crew will receive Gray FishTag gear for their tagging efforts. The tag recovery angler, Ross Clubb, will receive a pair of Costa Del Mar sunglasses, a Tag & Recovery Certificate, and Gray FishTag gear for reporting the tag recovery.